You are here > Home / Sold Winchesters / Winchester Model 1895 95 Sporting Rifle 1915 C&R Blue 24″ Lever Action & Lyman Sight .405 Win. Markings: The left side of the receiver is marked “MANUFACTURED BY THE WINCHESTER REPEATING ARMS CO. NEW HAVEN. CONN. U.S.A. / PATENTED NOV.5.95.NOV.12.95.AUG.17.97.JAN.25.98.AUG.23.98.AUG.6.1907.”. 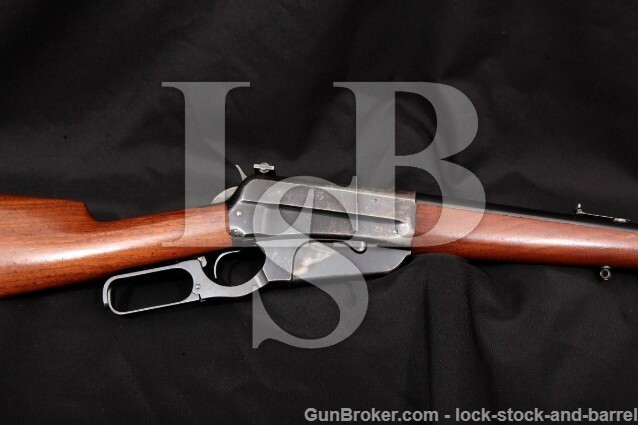 The upper tang is marked “MODEL 1895 / -WINCHESTER- / TRADE MARK REG. IN U.S. PAT. OFF.”. The lower tang is marked “73994” and “B”. The top left shoulder of the chamber ring and the top rear of the barrel are marked with a circled “WP” proof. The left side of the barrel is marked “-NICKEL STEEL BARREL- / ESPECIALLY FOR SMOKELESS POWDER” and “405 W.C.F.”. The front sight is marked “MARBLE”, the rear sight is marked “M.S.A.CO”, the receiver sight is marked with a Lyman logo and patent dates. Sights / Optics: The front sight is a Marble V.M. (Vickers-Maxim) aperture front sight dovetailed to a base fixed to the front of the barrel. The rear sight is a folding semi-buckhorn sight with “U”-notch adjustable for elevation dovetailed to the rear of the barrel. A Lyman No. 38 Receiver Sight is installed on the left of the receiver, quick-adjustable for elevation, knob-adjustable for windage and with a folding small aperture. The top of the chamber ring is matted for glare reduction. Stock Configuration & Condition: The stocks are two-piece smooth walnut with checkered steel shotgun-style buttplate, triangular ebony insert in the Schnabel forend tip, straight grip, straight comb and sling studs mounted front and rear. The forend has a few scattered light compressions and drag lines with a more notable ding on the bottom mid-way between the sling stud and receiver. The buttstock has several scattered light compressions, drag lines and scuffs. There are more notable drag lines at the heel and to the left of the top tang at the rear, and a shallow bruise on the left of the wrist above the rear of the lever. There are no chips or cracks. The LOP measures 12 5/8” from the front of the trigger to the back of the buttplate. The plate has mostly worn to white with finish left only in the grooves of the checkering, scattered scuffs, nicks and spots of light surface oxidation. The plate rates in about Good-plus condition. The stocks rate in about Very Good condition. Overall Condition: This rifle retains about 70% of its metal finish. The finish is thinning at all edges. The barrel has scattered light marks, nearly all forward of the forend, and scuffs with finish wear at the muzzle and on the bottom-left about mid-way between the forend and the muzzle. The receiver has scattered light marks and finish wear with the heaviest wear on the right-front. Some of the worn areas show light discoloration from oxidation. The lever and magazine show operational wear with some scattered light marks. The top tang has freckling scattered throughout. The hammer checkering shows light wear. The screw heads are mostly sharp with a couple showing tool marks with strong slots. The screw heads show finish loss except for those protected by the lever on the bottom tang. The markings are clear. Overall, this rifle rates in about Very Good condition. Box, Paperwork & Accessories: The installed receiver sight is included. Our Assessment: The 1895 Winchester was the first lever-action model to incorporate a box magazine. The box magazine allowed the use of spitzer-type bullets without the danger of ignition in a tubular magazine. The use of spitzer bullets improved ballistics and allowed for much higher velocities, especially with the use of smokeless powder. At the time of its introduction, the 1895 was considered the lever action big-game rifle. This is the model Teddy Roosevelt called his “Big Medicine” that he used in hunting here in America and in Africa. With its quick handling characteristics, box magazine and pointed bullet capability, the Model 1895 changed the world of sporting rifles forever. This rifle became the preference of major powers worldwide, with Russia alone purchasing nearly 300,000 1895’s just before World War I. This rifle was made in 1915 with a 24” barrel chambered in .405 Winchester. Despite being more than 100 years old, it is in about Very Good condition with about 70% of its original finish remaining. The bore is still bright with sharp rifling and no erosion. It has had a Marble V.M. front sight installed which allows the target to be seen, rather than covered by a bead or post and it has a Lyman No. 38 Receiver Sight installed, the most popular special order peep sight for this model. This vintage rifle will be of interest to both collectors and shooters. It is somewhat heavy compared with a Winchester Model 94, but packs a lot more punch, and its .405 chambering is good for any North American game animal as well as larger African game. While this rifle is likely to be snapped up by a Winchester collector, its great bore and strong mechanics would make for a fine hunting rifle for generations. Please see our photos and good luck! Blue 24″ Lever Action & Lyman Sight .405 Win.